I did it ! and loved every minute of it. "I completed the Hardmoors 110 - Ultramarathon". 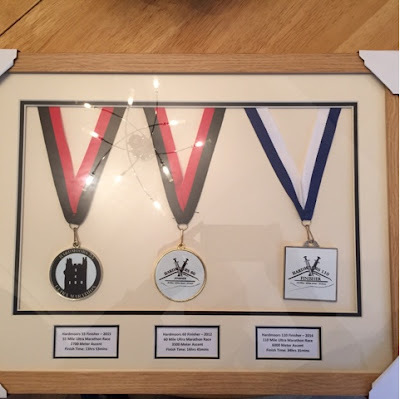 I would like to dedicate this post to my wonderful wife, family and friends for their continuous support throughout my strenuous & time consuming journey to completing the Hardmoors 110 Ultramarathon. I would also like to take this opportunity to pay tribute to 2 genuine and hardworking individuals, who without them my race might of been a different story to tell. 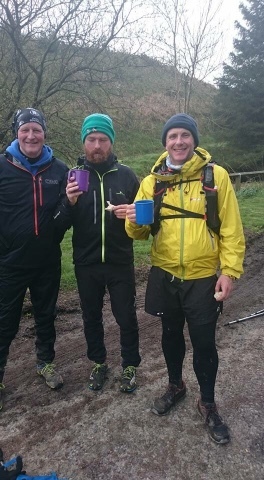 They are Jason Cameron and Ray Wheatly, who played invaluable roles as my race Support Crewe. Thanks lads !. 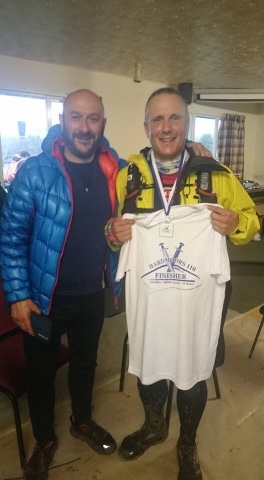 Further to this, I would like to congratulate my racing partner Jackie Buston on his fantastic finish of the Hardmoors 110. Well done Jackie !. Ok then, so here are the details and the "NITTY & GRITTY" leading up to and finishing the race. 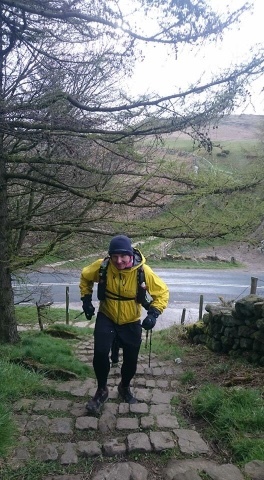 Following on from last years Hardmoors 55 mile race, "this by the way is where my friendship evolved with Jackie". 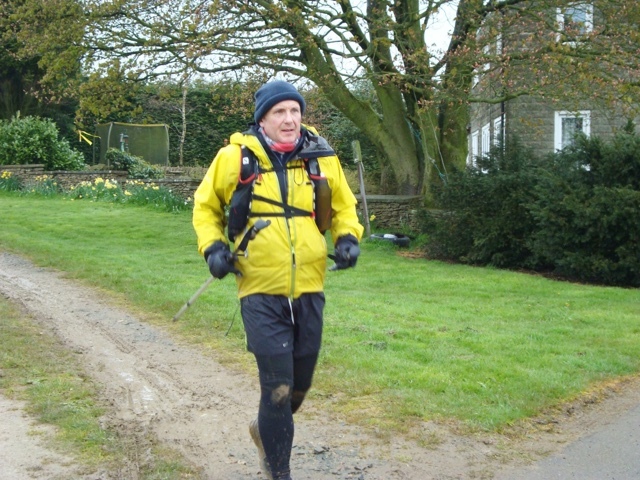 I was challenged by him in a friendly manner to join him on a 100 mile running race. I am sure that most of you who know me through various sporting themes that "I do love a challenge" !. As this challenges my planning and preparation skills learned from my own experiences out in the racing arena by constructing a training strategy and nutritional plan that is both "flexible and balanced" towards the demands of family, work and general life stresses. 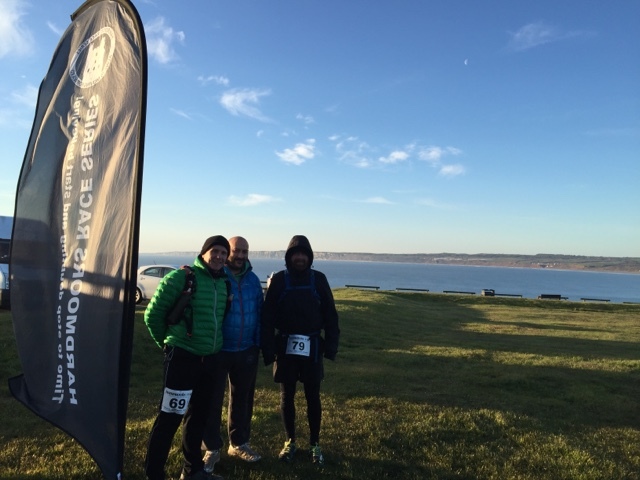 So we registered to compete in the 2016 Hardmoors 110, which is a 110 mile running race set out in the stunning North Yorkshire moors. I kick started my training plan shortly after the Christmas holidays. After successfully completing the "West Highland Way" 95 mile race in 2015. I decided to follow the same proven and successful principle called "PERIODIZATION". You may ask yourself what is meant by the term periodization ?. It entails devoting specific periods of time over the calender year to emphasizing different types of workouts, the three major ones being; aerobic base building, high intensity workouts and competitions, and rest / recovery periods over the duration several months. Further to this there was two other very important ingredients that I had adapted. With the latter being uncovered while listening to a Podcast (episode 26) of the "Science of Ultra". Presented by Shawn Bearden. 1/ Creating a strong & focused - "ULTRA MINDSET" preached by elite endurance athlete Travis Macey. That I could recite each day leading up to and during the race. Where I would recite to myself my own positive statements during any encountered low points of which would help to convince my mindset of the reasons why "I CAN FINISH" the race. "FLOW - PAITENTS - STRENGTH"
The raw ingredients of my strategy had included long back 2 back runs over most weekends, club hill runs with the Sunderland Strollers and long aerobic runs of up to 55 miles in distance. High intensity workouts such as strides, AT (anaerobic threshold) runs, hill repeats and gym exercises for explosive power. Most importantly lots of rest / recovery. My strategy went 90% to plan as I developed a virus and a pre existing piriformis injury which had resurrected it's ugly head. However, as my training strategy was designed to have a flexible and balanced approach. I was quick to adapt various microcycles to suit my mood, available strength and general well being. Not to bore you any further with training plans or strategies. To the point, the race went to plan and I completed the 110 mile race in 34 hours & 35 minutes. I was pleased with my performance as I only suffered one low point which occurred at 90 miles in to the race, where hallucinations was triggered by sleep depravation. 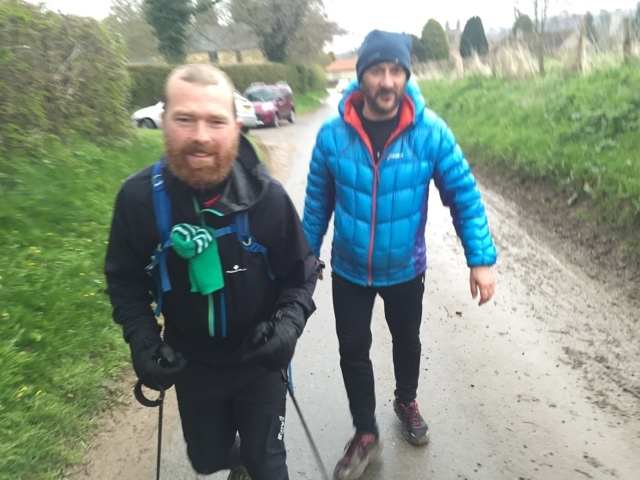 However, I quickly took charge of my tired mindset and aerobically cruised past the 100 mile checkpoint in style and completed the race with a traditional sprint finish. 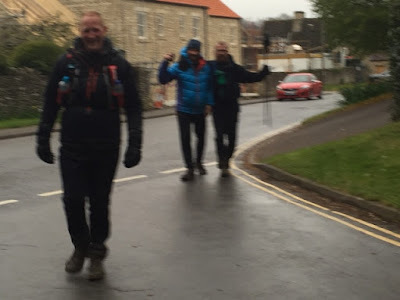 To be honest, I felt as thou I still had another 20-30 miles left in my legs to carry on further. One final element that would make my epic journey complete, was to see Jackie crossing the finishing line within the 36 hour limit. After 10 days of rest from all exercise I had my first trail run, which was the kick start of what I call "maintenance base" miles. And to help me asses when the time was right to start my maintenance milage. I used a heart rate monitor that would give me data of my "resting average heart rate". From 67bpm (beats per minute) back down to my normal 56bpm. So you may ask what is next ?. 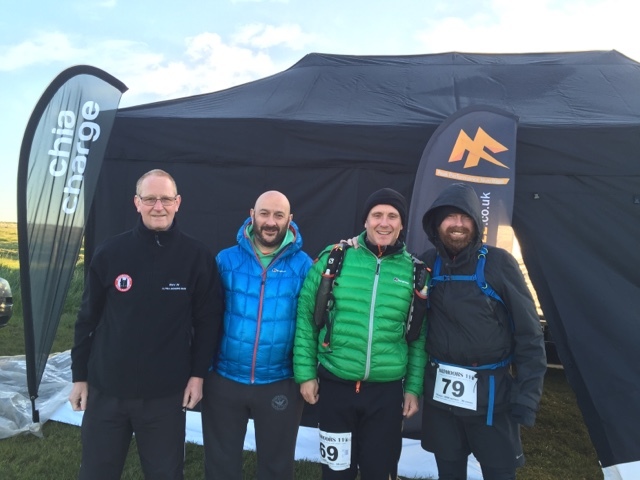 Well Jason, Jackie, Ray and myself have decided to compete in the 2017 "Sandstone Way" Ultramarthon. 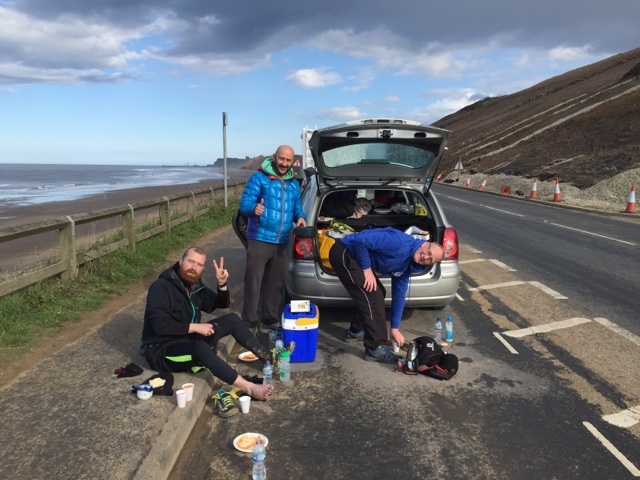 This is a 120 mile running race starting in the beautiful seaside town of Berwick and finishing in the rural market town called Hexham.